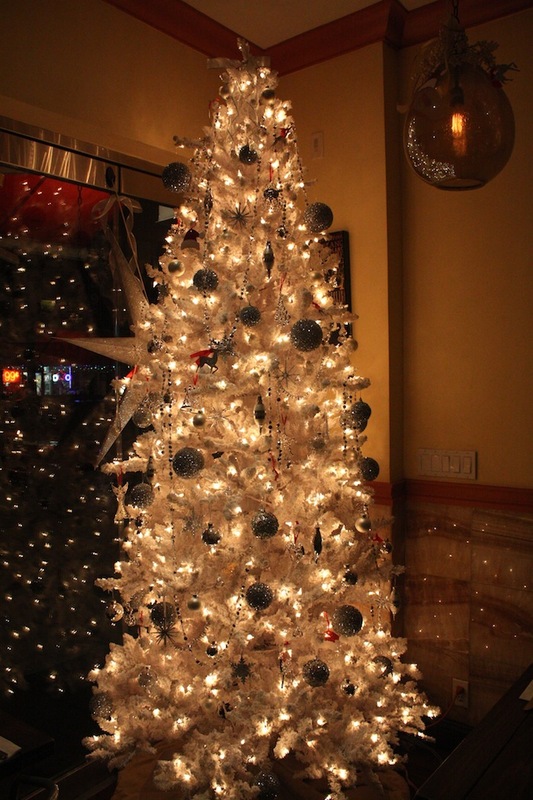 Holiday time at The Thirsty Koala. 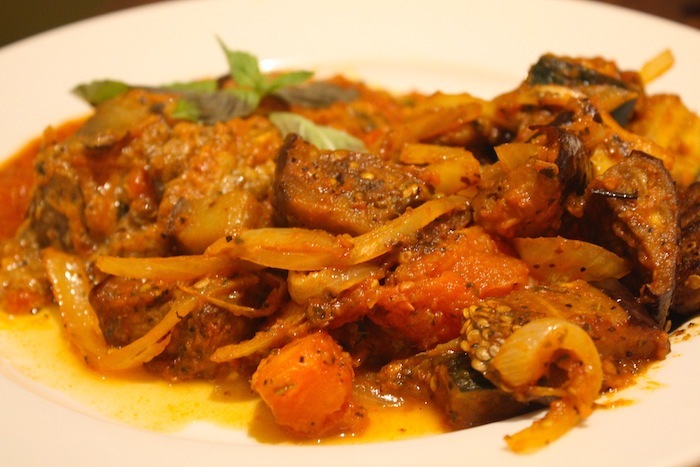 Earlier this month we were invited to taste some of the dishes on the new menu at The Thirsty Koala and were thoroughly impressed. I’ve been eating at the restaurant on and off since it opened and am pleased to see how the food continues to just get better and better over time. The freshness reminds me a lot of the green-market-driven food I ate in my home state of California. Full disclosure: this meal was comped. Here we go! First, we had some cocktails. 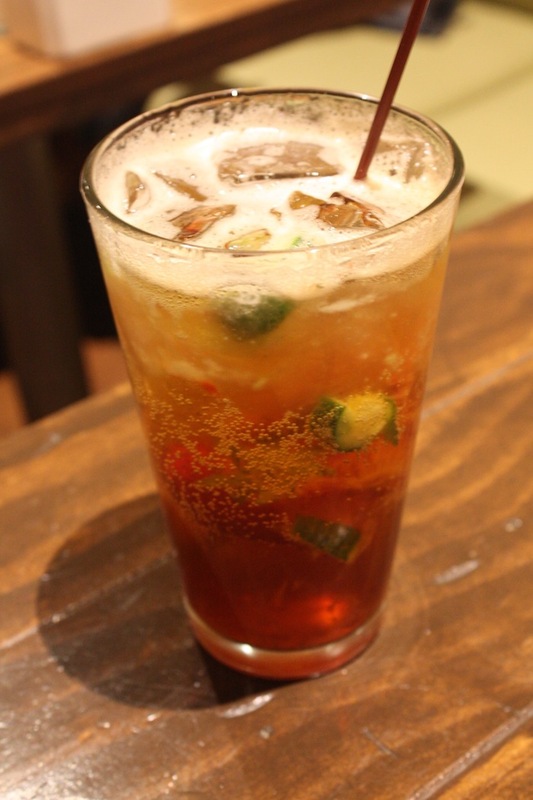 Pictured here are the Dingo and the Koala Pimms Special. 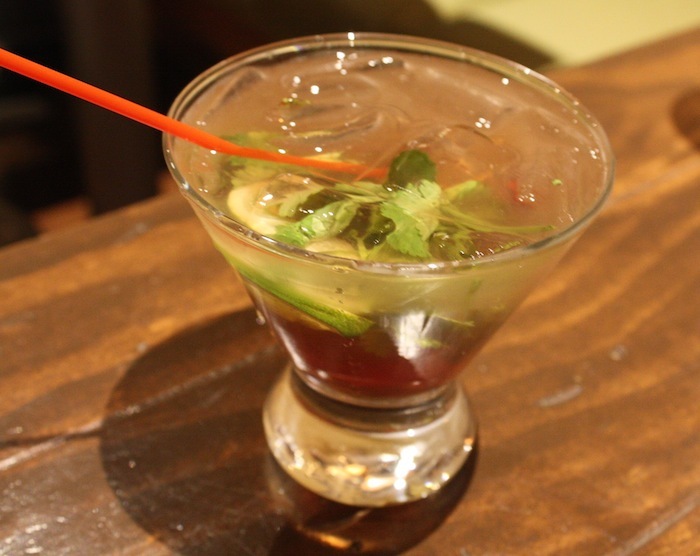 The Pimms is more familiar with Pimms, lemonade, club soda, cucumber syrup, and fresh strawberries but the Dingo contains an unusual mix that really works (for me, it’s the Chambord), made from Bourbon, Chambord Liqueur, agave syrup, lemon juice, lime wedges and cilantro. On the appetizer side, we had homemade kalamata tapenade with toasted bread, gluten free fried calamari, burrata with fruit, Thea’s meatballs, and corn jalapeño fritters. In particular, I couldn’t get over how light and tender the GF calamari was. In general, I don’t like fried calamari (or really any calamari), but this version blew me away with how good it was. No chewiness was detected and we basically couldn’t stop eating it. It comes with a side of thai basil yogurt sauce and sweet chili sauce. GF friends, know that they have a dedicated fryer for their gluten-free items, so the chance of cross-contamination is pretty low. 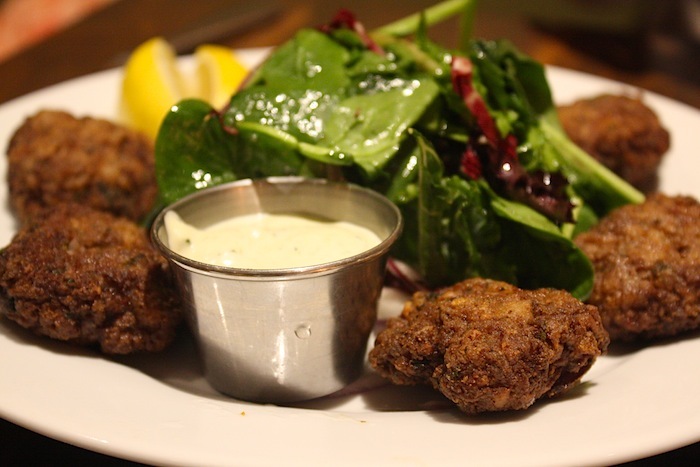 I loved the meatballs, too, which are made from grass-fed beef and come with the thai basil yogurt sauce. They are good with a squeeze or lemon, too. 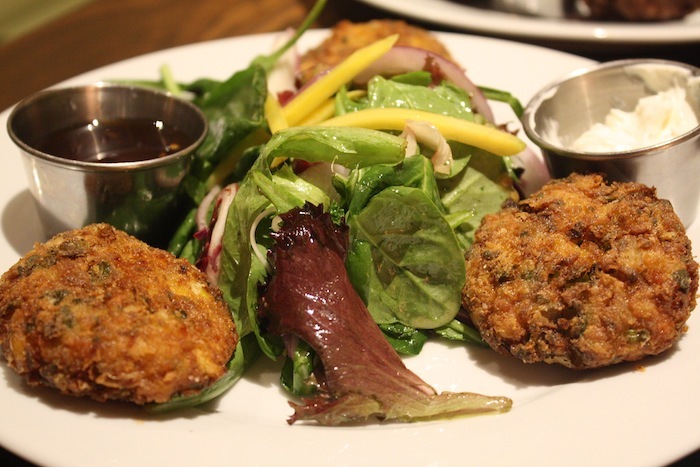 As for the corn jalapeño fritters, I knew what I was getting into since I had them at brunch recently and totally fell in love with them. It’s hard to go wrong with the combination of jalapeños, corn, and cheese. They are served with sour cream and the sweet chili sauce. The burrata was a surprise with the fruit. I hadn’t eaten it before with fruit and afterwards I wondered why I had never considered such a great combination. It comes with sliced or chopped nectarines, strawberries, mangoes, and kiwis. And a lemon basil pesto. The sweet, savory, and herbal flavors all combined is a refreshing change of pace. 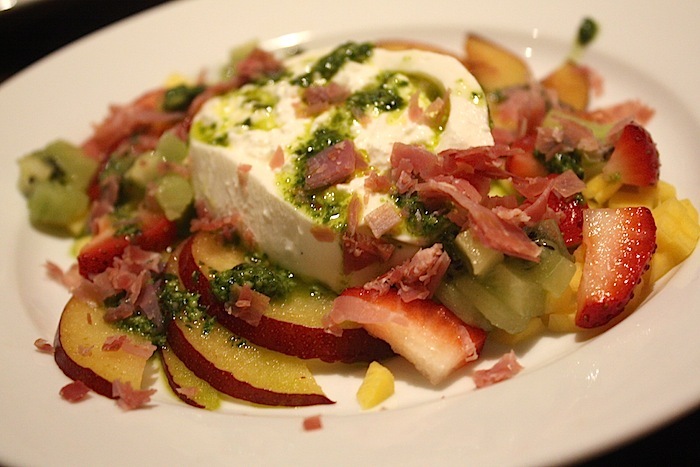 Plus burrata is simply awesome, period. 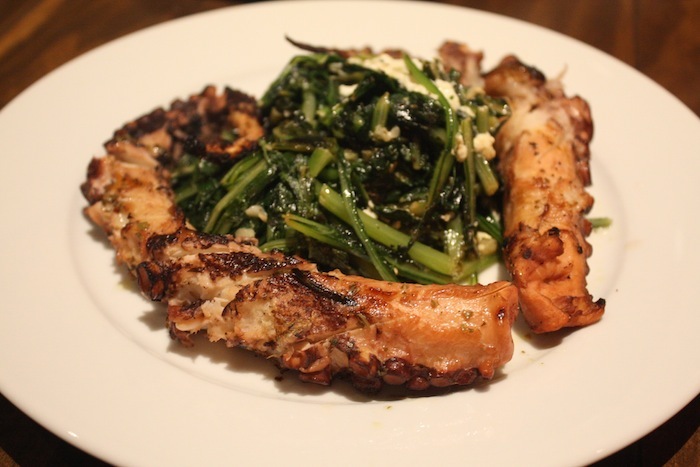 A couple of seafood apps include a stuffed and grilled calamari dish and some grilled octopus with field greens and feta. 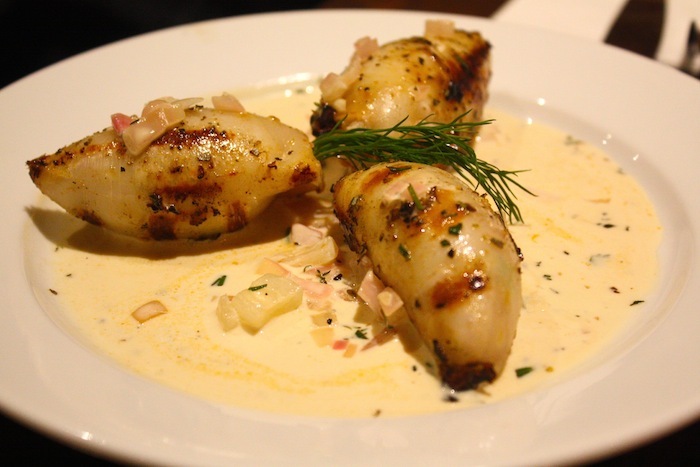 My dislike of calamari returned with this stuffed calamari, which was just too much ur-calamari for me. Emily, on the other hand, loved it. That said, the filling is rather tasty, made with chorizo, octopus, feta, herbs, all served with a citrus beurre blanc. 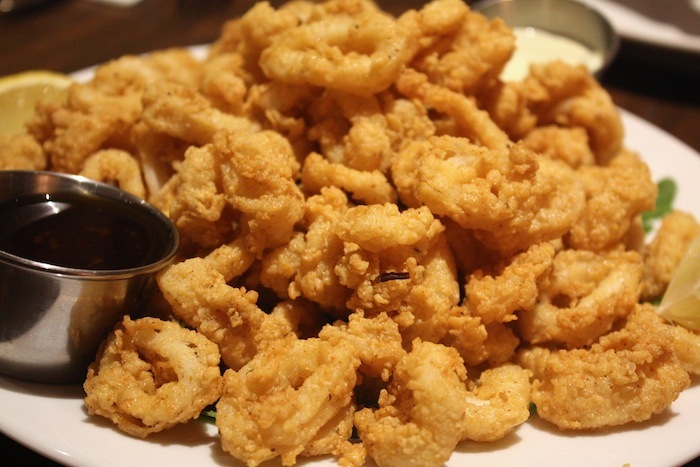 Basically, I just can’t get over the rubberiness that is inherent to big pieces of calamari. More for you. Tender on the inside, a bit crispy on the exterior, with a hint of flavor from the grill. What could be better? 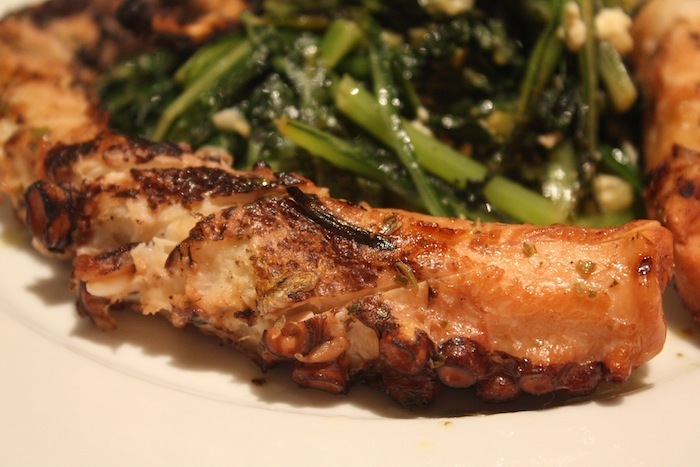 It is served with horta mixed with feta, which is a nice nod to the neighborhood. The piece itself is also quite substantial. On the main dish level we had barramundi amandine with lemon myrtle rice and lamb lollies. I have loved the lamb lollies since I tried them when the Koala first opened. They are grilled to your preferred doneness, and are also seasoned with wattleseed, native to Australia. It gives off a rich herbal flavor, at least to me, and is a little bit smoky. 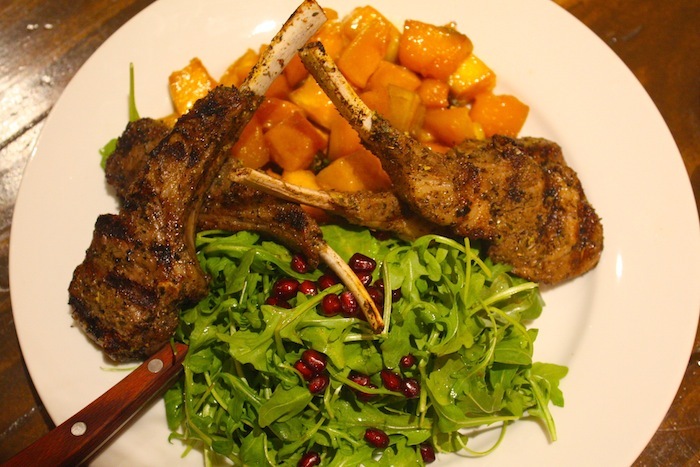 The lamb is served with a simple baby arugula salad with pomegranate seeds and some toothsome caramelized pumpkin. The barramundi amandine was something I was unfamiliar with but really enjoyed. 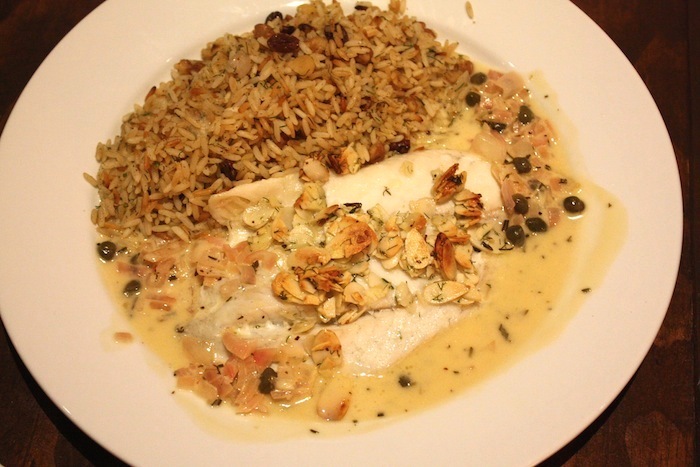 Barramundi is a light white fish (Australian sea bass) and it came with plenty of almonds, and a citrus beurre blanc with capers, shallots, and fresh herbs. On the side was lemon myrtle rice, lemon myrtle being another herb native to Australia. The rice is baked a bit, lending to bits of more caramelized rice. If you like the combination of white fish, lemon, almonds, cream, and rice, this is the dish for you (it certainly was for me). A couple of sandwich-type items included the Australian sausage roll and the jaffle known as the Banjo Patterson. It was recommended that we eat the sausage roll with ketchup, which is the style in Australia, and it married perfectly with it. I can’t imagine A-1 Steak Sauce having the same effect. The pastry was flaky, and the sausage was mild yet meaty, made on site out of pork belly, ground beef, and a few other things. 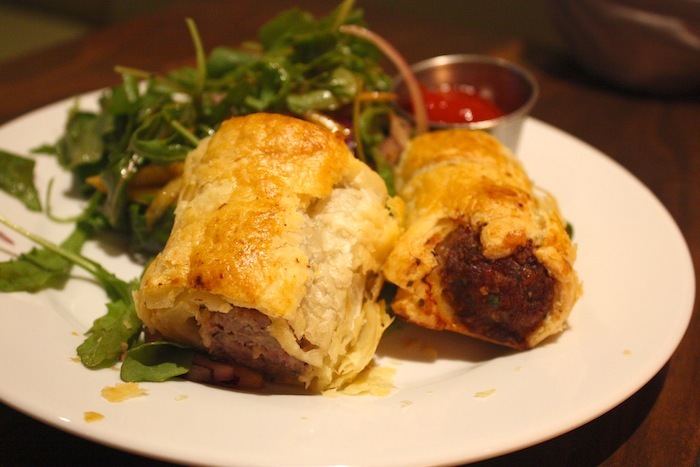 I could imagine enjoying this sausage roll and an Australian beer (they serve Cooper’s and Moa) for snack after work. 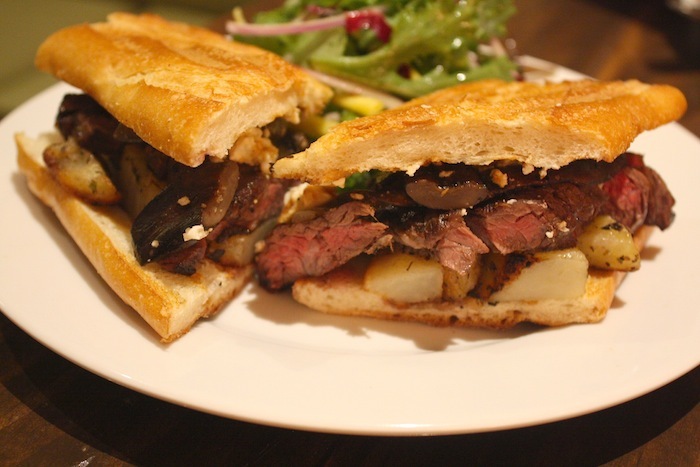 The Banjo Patterson jaffle (sandwich) is a new incarnation of the original, this one containing grilled skirt steak, mushrooms, onions, lemon potato, barbecue sauce, feta cheese on a baguette. Lots of umami going on, and so savory. I took part of it home and truly enjoyed the leftovers. Yes, we had eaten a lot by then. Toward the end of the meal we were served a vegetarian lasagna. The lasagna had fallen apart a bit but no worries here. It’s made with seasonal vegetables (eggplant here), non-GMO organic tofu, shallots, onion, garlic, fresh tomato marinara, and fresh herbs. I especially liked how the eggplant was neither tough or mushy. 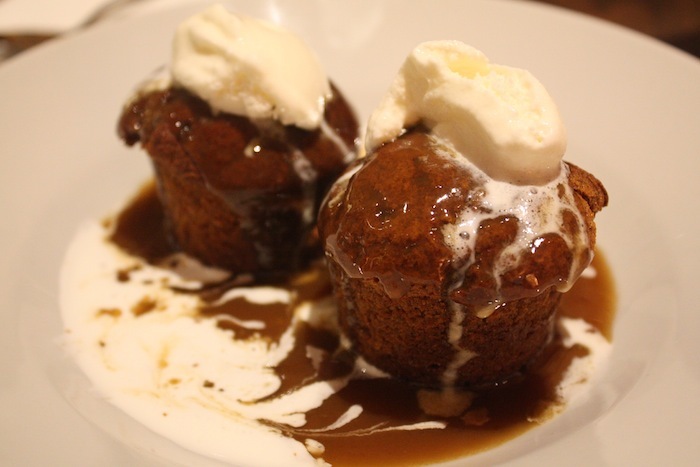 For dessert there was sticky date pudding with ice cream. Most of us know sticky date pudding in the form of Vesta’s Baby Jesus Cake, which is good, but this could give that a run for its money. The crumb of the pudding itself is rather fine and gives it a more refined look. I liked the ice cream served with it. If you like sweet caramelly cakes, this one’s for you. I’ll certainly be back to have it again. So there we have it. 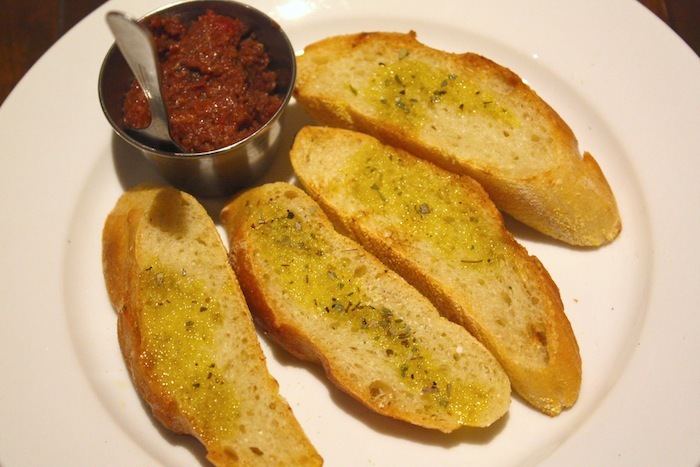 Some great new dishes at The Thirsty Koala these days. Another tip—the treatment of the corn-jalapeñ0 fritter is awesome at brunch on the weekends. There are two of them served with two poached eggs, avocado salsa, rocket (arugul) with your choice of Canadian bacon, smoked salmon, or spinach. The Canadian bacon is a great option. I loved it and look forward to the next time I can eat it.